Over at The Paper Girls Challenge Blog we have been working on water colouring projects. I wasn't feeling the layout vibe, so I decided to make a shadow box. With time being spent at the lake I felt like it was time to add another project to the empty walls down in that cottage of ours. Last summer while out on the boat one evening with the hubs there was a gorgeous red and yellow sunset over the shoreline and lake. I snapped a few shots and have been waiting to use them for something. The water colouring challenge seemed like the best idea! I could use the colours in the photo and reflect them back in how I wanted to colour. I apologize, I only had an iphone photo of this. ﻿ When it came time to put the shadow box together I didn't want to use the water colour paper as a whole piece in the background. I was trying (if it's possible to see) to emulate the way the water rippled and the wavy-ish texture of the clouds which bounced the colour around a bit in the photo....well that's what I was trying to go for in the background too. I'm not sure if it ultimately worked but I do like how it came together regardless. I used Kiwi Lane Designs templates to trace out the waves and alternated using the water coloured paper and Kraft paper. So now it's time to package this baby up and find the perfect spot to hang it on the wall at our cottage. Be sure to visit The Paper Girls Challenge to see all the beautiful water coloured projects! Also a self plug here....please visit our cottage blog too! It's still in it's early stages and like I say, blogging has not been on the top of my list of "To-Do's" but it's got some great info about the area! PGCB - Oodles of Doodles! My good Scrappy Friend Kristy challenged the team to use doodling on our projects this week. I must admit that I haven't really doodled before and loved the freestyle technique. I have been exercising my doodles while working on my Las Vegas SMASHbook. 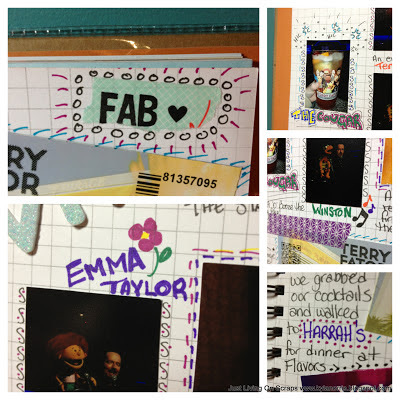 Here's another couple pages dedicated to our night out to see the Terry Fator Show. 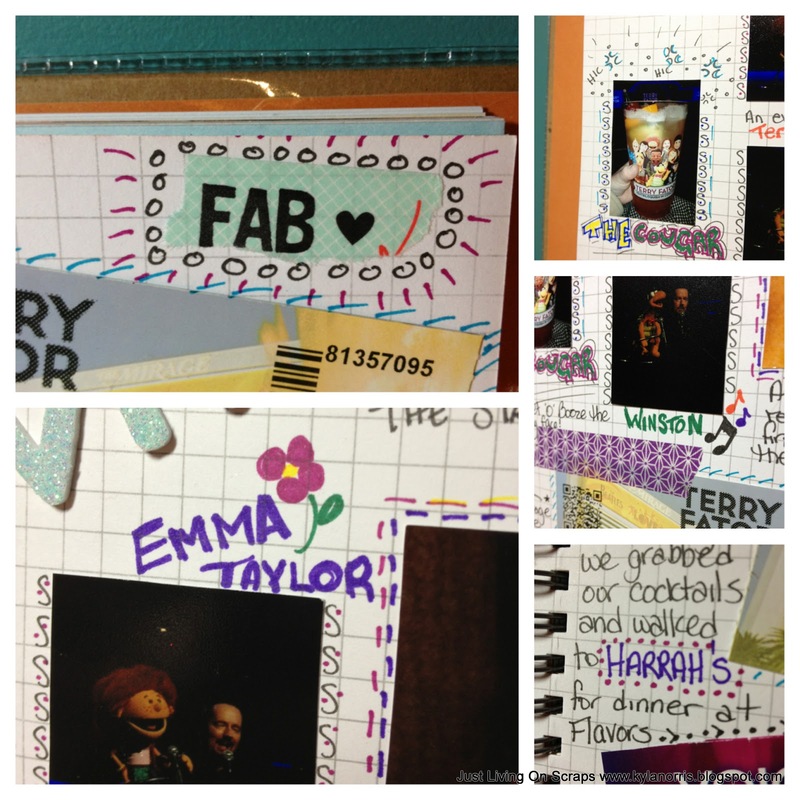 My dooles are mostly to border the photos and added some colour to some of the journaling. I had fun just making it up as I went along. But alas I will eat humble pie and admit that I had a great time! The music was fantastic and Dan and I made friends with the 2 older ladies sitting next to us and the 4 of us found ourselves singing and dancing along more than once or twice! Among the many laughs I was surprised that twice I was reduced to tears sobbing listening to two songs that Terry had written. All in all a great night. Along with our tickets we had received vouchers to check out the Flavors Buffet at Harrah's Casino......ummm it was anything but flavourful but for $0 it was a meal. It's definitely better than paying upwards of $100 and not enjoying it! This was also our first full night in Vegas after arriving, so it was our first time experiencing the Strip at night all lit up. It was pretty incredible and it was a veritable "Disney for Adults". It took me awhile to get used to being able to carry my cocktails with me everywhere. Walking up and down the street with my "Bucket-O-Booze" was pretty awesome. My one cocktail (ginormous!) that I bought at the theatre lasted me the entire night, so I lugged it around with me from the theatre, to the casinos to the restaurant and back again. Be sure to go to The Paper Girls Challenge Blog to see all the other amazing Doodles and to enter your own project! Another Monday has arrived and with that a Paper Girls Challenge project! Judy challenged us all to create something with a Travel theme. I love this theme! I absolutely love travelling somewhere new and trying to see and learn and do as much as I possibly can in the time that we're there! In February of this year my husband and I decided to go on vacation for a few days to Las Vegas. We had an amazing time and we visited so many places! I wanted to scrap all our memories, but I'm finding nowadays I have alot less time to scrap and therefore layouts are few and far between these days. This vacation was only 4 days long so really a full vacation album is too much, but there's so many things for only do 1 or 2 layouts. I have been wanting to try a SMASH Book since they were released a couple of years ago, but have never taken the plunge. For Christmas my sister was awesome and sent me a gift certificate to a big craft store, so I thought now is the perfect time to try something new that I have always wanted to! I have to say as a first time "Smasher" I think I am hooked already. I loved how fast the pages come together and really do just randomly smash things in. I can't wait to work on the rest of it! Now make sure to go visit our site to see all the Travel projects our team created!! ﻿Usually I am all about the crafty post, but tonight I thought I would blog about something new and exciting that's going on in our family. As most of our nearest and dearest know, at the beginning of last summer my husband, my sister in law and I pooled our resources and purchased our very own cottage by the lake. It's not just any lake either, it's the lake that both Dan and Josee have grown up on over the last thirty one years! To say that it means the world to us now that we are able to show Oliver where his Dadda and Auntie spent their summers is an understatement for sure. We were also blessed with a piece of land that had an extra cottage built on it which has given us the opportunity to follow in the footsteps of the previous owners and use it as a summer rental. So after a couple weeks of work and tweaking I am pleased to present The Gunville's Cottage Blog! Here, I hope to update all summer about the goings on locally as well as post our rental calendar etc. There's photos, a video, local attractions, just come on by for a visit! Our team member Erica over at PGCB thought that after our one year anniversary washi giveaway, a washi challenge would be a perfect follow up! I have a love/hate relationship with washi. I must confess. I absolutely adore all the patterns and colours that exist and I have slowly been collecting a stash of my own at home. However. When it comes to using washi I find I'm still very intimidated by it or just at a loss on what to do with it! This challenge was perfect for me to stretch my washi legs and use it in a layout. It worked perfectly as a minimalist material when I wanted the photo to do most of the speaking. I took this photo the morning we left The Lodge. The sun was shining, the sky was gorgeous, the mountains were stunning and the way the light was hitting the treehouse was amazing. I wanted this to be my last photo of Loch Goil before we headed off. I used the gold striped washi to create a diagonal backdrop and then quickly sketched some lines over top. 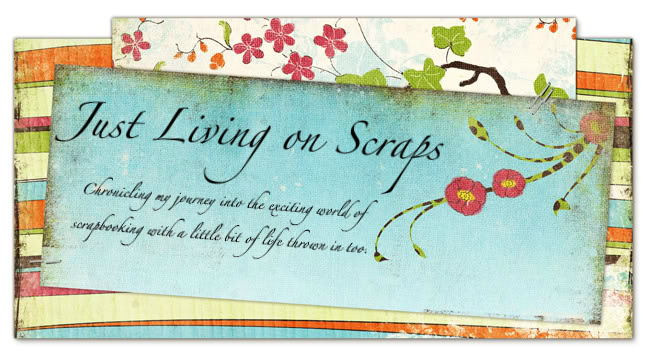 I only used some scrap pieces of paper for around the photo and used some green washi to accent the edges. I inked up some Thickers for the title with distress ink (I love Thickers but find I can never find the exact colour I'm looking for) The layout was still falling a little flat and empty, but I really didn't want to do too much more too it, so I flicked some Mr Huey's in the corners and left it at that. After 24 hours in Glasgow, we arrived at The Lodge to spend the weekend. For the wedding, the entire place had been booked by us and fellow guests and family so we had the place to ourselves. It was incredible! Tucked away on the shore of Loch Goil in the mountains, staying there made me feel as if I had stepped back in time. Originally built in 1869, The Lodge was a modest summer home and is now a 5-star Hotel in the Scottish countryside. I feel blessed that I was able to stay here with truly fantastic people and be present for an equally fantastic wedding! Here is another layout that I made ages ago. My brother and I the afternoon of the wedding drinking champagne on The Treehouse stairs. I realize that this album is taking me FOREVER to complete, but there is a light at the end of the tunnel I promise ;) In the meantime I am thoroughy enjoying working slowly and steadily on my holiday album. 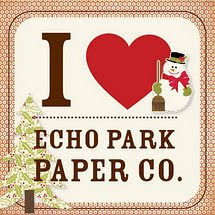 Be sure to go and check out all the amazing washi projects for our team at The Paper Girls Challenge Blog! Paper - Ranger Kraft Cardstock. MME Kraft Funday. I am trying my best to keep up with blog posts and crafting. I do find lately I have less and less time to craft. This week at The Paper Girls Challenge Blog my good friend Kristy has asked us to use twine on a project. A crafty group that I'm part of is doing a Birthday Card Swap this winter. We all make 10 birthday cards, send them to our cheif card collector, who will divide them all up and send us 10 different cards back. We then have some scrappy goodies from our Scrappy Sisters from all over North America, but it means we also have some cards on hand to send to loved ones! I received this stamp set a few months ago from The Stamps of Life by Stephanie Barnard. I've been dying to use them! I thought a card swap and a twine challenge would be perfect! For the background I watercoloured with Distress Inks. I stamped my ink pads onto some waxed paper and then sprayed them with water. Using a paint brush I painted the different shades of blues and purples onto water colour paper. The turtles were stamped and cut out and coloured using markers. To give their shells some texture, I first coloured them in brown and then used the same brown on the stamps. Stamping the patterns in the same colour brown just subtly added a bit of design to them. The bottom of the card I wound twine around and added a banner with some foam adhesive with another sentiment underneath. It's time for another Paper Girls Challenge! Heather has challenged us this time to add wooden elements to our projects. There are kits out there that include wood veneers/embellishments but not to worry, if you don't have those you can get creative with things around the house like toothpicks! You know me, once I start on a project I rarely deviate from it until it's complete, so it's no surprise that another Scotland Vacation layout came about! What I am super satisfied with is that this layout completes our trip to The William Wallace Monument in Stirling! The other layout has all the journaling and title, hence the lack of either on this one. We were on our way back to the cottage after spending the day at Stirling Castle. We had about an hour before the monument closed so we zoomed in to check it out! Thank goodness we did!! Soooo cool! So William Wallace was born around 1270 and became a great figure head and leader when it came TO fighting for his country's freedom during the Scottish Rebellion against the English in 1297. He was also made popular by Mel Gibson painting his face blue and yelling "You can take our land, but you can't take our freedom!!" (or something like that) in Braveheart. We made our way to the tippy tippy top of the tower and it was freezing!! We did even spy snow! Alas with time running out and and icy wind blowing we only stayed at the top long enough to appreciate the gorgeous view and to snap a few photpo before making our winding way back down to the bottom. Kyla has read 1 book toward her goal of 35 books. Kyla has read 11 books toward her goal of 30 books.